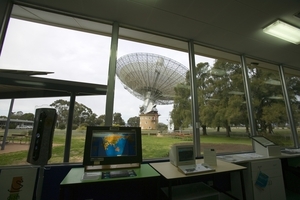 The visitors centre and dish café at the CSIRO Parkes radio telescope caters to 100 000 visitors each year. There are displays and exhibits about the telescope and radio astronomy as well as theatre presentations. Entry to the centre is free and it is open 8:30am to 4:15pm every day except Christmas and Boxing Days.